Baltimore Inner Harbor's only family owned STEAKHOUSE. Featuring Prime Steaks, Chops, Seafood and Authentic Pasta where Miss Bettie has been preparing her Italian Dishes, soups and sauces for the past five decades. 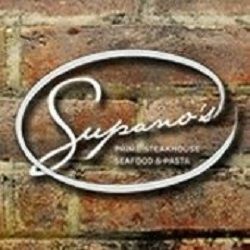 Supano's provides dining for you or your group. Known as "The Place Where the Locals Dine and Drink". Old School Baltimore atmosphere interestsall from around the globe. Located on the Brick Cobbled Stones of Water Street where you might think you are on the Mediterranean Sea and through the big old wooden doors you will find your passion for food, beverage and music. You may dine inside or out.Our family invites you to step into our world where you will find yourself Lost in the Sauce. Take a trip down memory lane with the Sinatra Era Music in the background. Supano's feature Frank Sinatra and Dean Martin Tribute artists Friday & Saturday Nights in the Sinatra Bar plus Live Blues & Jazz. Our restaurant is dedicated in appreciation to my wife Olga who stands by me daily in life, to my father Thomas Coffman Jr., Frank Sinatra and Dean Martin. Dad, Blues Eyes and Dino are gone now, but not forgotten.Terry Coffman Sr,The Brick Cellar is known for its local and world renowned jazz artist's performances and even Wynton has been known to stop by and jam for an hour. So do not be surprised with our New York/New Orleans Jazz Room in Old Baltimore.p.s. Goodnight Grandma Supano where ever you are. Thanks for the memories. Budweiser, Coors Light, Bud light, Miller Light, Yuengling, Heineken, Sierra Nevada, Corona, Corona Light, Guiness, Amstel Light.